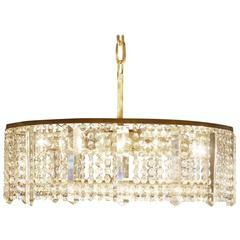 A monumental midcentury cut crystal and patinated brass twenty-one-light chandelier by Bakalowits & Sohne, circa 1960s. Especially nice in detail, edged with crystal pearls elements. Socket: 20x Edison (e14)/ 1 x e27 for standard screw bulbs. In a very good Original condition. Wiring works very well. For more than 170 years, lovers of chandeliers and builders of monumental public buildings have looked to Bakalowits of Vienna for dramatic lighting. In addition to the Vienna State Opera and the parliament building in the Serbian capital of Belgrade (home to one of the world’s largest crystal chandeliers), the company has created light fixtures for cruise ships, palaces, and other splendid spaces around the world since 1845. Five generations later, Bakalowits is still family owned. Awarded a Royal Warrant—and a commission for the Redoutensaele concert halls in the Hofburg Palace—by Emperor Franz Josef in 1892, Bakalowits began patenting its designs in 1928. Production slowed dramatically during World War II, but the company’s fortunes revived dramatically after the war as European cities began the painstaking process of rebuilding. Far from stuffy, Bakalowits designers have frequently captured the exuberant spirit of modernism. As you will see on these pages, whether your tastes run to traditional grandeur or contemporary chic, Bakalowits has a lighting fixture for you. Rare mid century glass and silvered chandelier by Bakalowits & Soehne, Austria, circa 1960s. Socket: Nine x Edison (e14) for standard screw bulbs. Very good condition. A very rare model of midcentury glass and brass chandelier by Bakalowits & Sohne, Austria, circa 1960s. Socket: Four x e14 (Edison) for standard screw bulbs. Classsy Bakalowits Austria, 1960, crystal chandelier on a chrome frame. 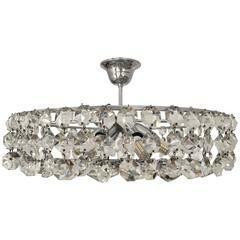 Cat crystal chandelier from circa 1960s attributed to Bakalowits &amp; Sohne. Brass construction nickel-plated. Electric fitted with six E27 sockets. On request higher rod.